One-two-three-four! We’re making some noise this week on C-U Blogfidential to ensure you read about the premieres of four distinct projects with area ties as well as view their videos, despite the fact we’re trailing badly in the “timely news” department! 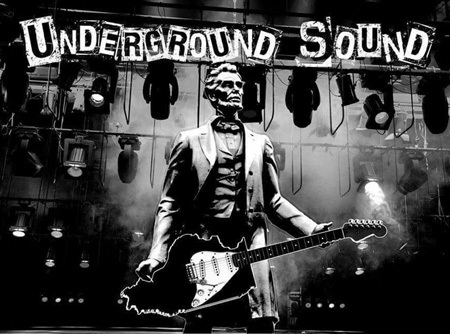 We’ll first recount a 24-hour cycle that began the evening of Wednesday, May 3, when the Avon Theater in downtown Decatur hosted the public debut of the documentary UNDERGROUND SOUND by media entrepreneurs Ben Harl and Adam Thompson of Dark Soul Entertainment. Between the two previews released in advance, one a rapid-fire introduction to the film’s interviewees and the other positing Big Questions about the worth of music in our lives and communities, it’s clear that UNDERGROUND serves as a loving overview of Decatur’s current music scene. Since those outside the Soy City won’t necessarily be familiar with their movers, shakers, and beat makers, the production is a welcome addition to the slowly growing stable of local rock docs. That said, we’re happy to see movie music composer Eric Watkins and versatile guitarist Michael “Guido” Estevez included in the mix. DVD copies of UNDERGROUND sold out mere days after the show, which doubled as a benefit to raise funds for the Decatur chapter of the First Gig Rock N’ Roll Camp for Kids, so lucky for you it goes live on YouTube for free streaming on Monday, May 21. Also be sure to follow Dark Soul on Facebook and watch for future news on their first long-form narrative, STORY OF THE YEAR, scheduled to be shot this summer according to recent postings. While the UNDERGROUND crowd and the rest of our Midwest slumbered that night, a cult film with a pieced-together reputation was finally reconsidered on the whole thanks to the efforts of Ed Glaser from Neon Harbor Entertainment in Champaign. Viewing groups in London, England, and Glasgow, Scotland, set up simultaneous “Star Wars Day” unveilings on their May 4 to bask in the glow of a new 2K transfer for the 1982 Turkish pulp adventure DÜNYAYI KURTARAN ADAM, or, THE MAN WHO SAVES THE WORLD. Appearing in London to address the Remakesploitation Film Club at the Cinema Museum, Glaser certainly relayed his “holy grail” discovery tale in which he met a retired projectionist in Turkey who had in his collection a 35mm print of the opus, known colloquially as TURKISH STAR WARS due in part to the producers’ inclusion of permanently borrowed effects footage and soundtrack scores from Hollywood blockbusters of the era. Glaser purchased the print, believing it the only one still in existence, and had it digitized to share anew. Even with the dubious prospects of DÜNYAYI KURTARAN ADAM receiving distribution outside of Turkey in the 21st century because of those illicit elements, the move falls perfectly in line with Glaser’s mission to promote the inherent joys of international genre cinema playing off American movie conventions to their own ends. Previous projects include DEJA VIEW, an ongoing Web series exploring the histories and merits of these knock-offs, Dracula in Istanbul, the first-ever English translation of an illegitimate “rewrite” of Bram Stoker’s original Dracula novel first published in 1928, and RAMPAGE, an English-dubbed U.S. release of the so-called TURKISH RAMBO, a.k.a. KORKUSUZ, directed by the prolific Cetin İnanç who also piloted TURKISH STAR WARS into the stratosphere. Sadly, this last one is now out of print. Later that same day on our side of the globe, a young Windy City filmmaker pulled the curtains back on his sophomore micro-budget feature to the delight of his modest audience and as proof of undeniable talent behind the camera. The Nightingale in Chicago served as the venue on Friday, May 4, for writer/director Nick Alonzo and his tiny crew to introduce their collaboration, THE ART OF SITTING QUIETLY AND DOING NOTHING, which follows twentysomething Carl, played by Alex Serrato, who decides to live in the woods as an escape from both city environs and the still-fresh hints of his broken relationship with Gloria, played by fellow moviemaker Alycya Magaña. from Nick Alonzo on Vimeo. Reviews from news outlets like Cine-File Chicago, Daily Grindhouse, and Time Out Chicago have been complementary and position SITTING QUIETLY as a dramatic advancement over his first full-length effort, the pleasantly wry “slacker in the city” travelogue SHITCAGO. We ran a preview for the latter at the 2015 New Art Film Festival because, although it wasn’t a downstate Illinois production, it represented a deceptively simple yet tactile vision unlike anything our audience had seen before; the film itself would have been exactly the kind of surprise to tickle our fancy if it had appeared in our P.O. box as a screener during the MICRO-FILM era. Those looking for a true antithesis to anything labeled “summer movie” should go out of their way for SITTING QUIETLY (in all senses of the phrase) if it happens to be playing nearby, although we feel Alonzo’s film voice deserves to travel beyond Chicago this time around. Equally worthwhile Chicago voices can be amplified on screen with a little help from their Champaign-Urbana friends, evidenced in a recently finished five-episode Web series called SEEDS. 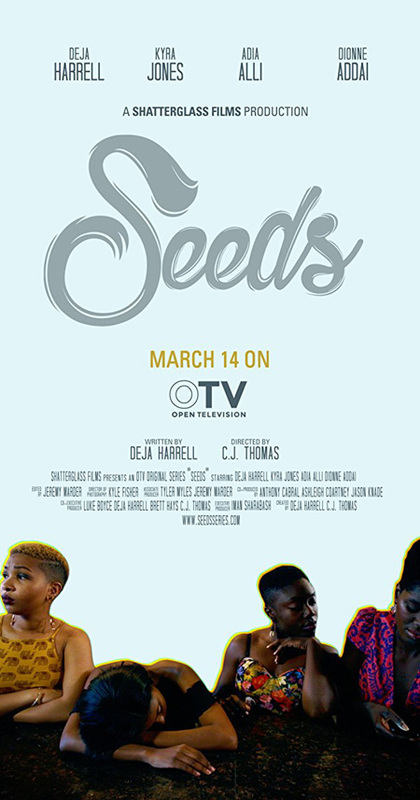 First shown to the public at the Chicago Cultural Center on Wednesday, March 14, SEEDS is the creation of director/producer C.J. Thomas and actress/producer Deja Harrell, Chicagoland natives who strove to develop a lively, relatable, and sometimes pointed approach that is populated by characters that honestly reflect young African-American women like themselves. SEEDS stars Kyra Jones, Dionne Addai, Adia Alli, and Harrell as college-age friends who navigate contemporary Chicago with a close kinship that allows for easy and frank discussion among them whether at home or in a public or social setting. Their adventures can be watched on the Chicago-based platform OTV: Open Television, a haven for progressive self-made storytelling that helps to fill the media needs of underserved communities. SEEDS \\ Official Trailer from Shatterglass Studios on Vimeo. Between contacts from up north and relationships built here in east central Illinois, the duo put together a crew to film SEEDS in Chicago last summer and push through a post-production period in time for the March debut. This includes involvement from Shatterglass Films of Champaign, where both Harrell and Thomas – the latter a pseudonym for Illinois Public Media and Art Theater employee Caitlyn Johnson – interned while studying at the University of Illinois, so it is no surprise to see names in the credits roll that carry over from past Shatterglass projects. Most prominent is the versatile Iman Sharabash as an executive producer. If SEEDS takes root, may we get to enjoy the fruits of future seasons thanks to the team effort! This entry was posted on Wednesday, May 16th, 2018 at 12:00 pm	and is filed under Alums Done Good, Music Video, Preservation, Production Updates, Public Events, Videos du C-U. You can follow any responses to this entry through the RSS 2.0 feed. Both comments and pings are currently closed.